Former NFL coach/player/broadcaster John Madden retired from broadcasting today. Because he's afraid to fly, he logged 80,000 miles annually on a custom bus dubbed "The Madden Cruiser." We take you inside this great beast. There isn't just one Madden Cruiser. Like James Bond, they get replaced when they get too old. Currently, the latest Madden Cruiser is Madden IV, with the first one going back to the late 1970s. The idea came when Madden needed to get to a photoshoot quickly and CBS rented Dolly Parton's tour bus. He loved it, and got one of his own. 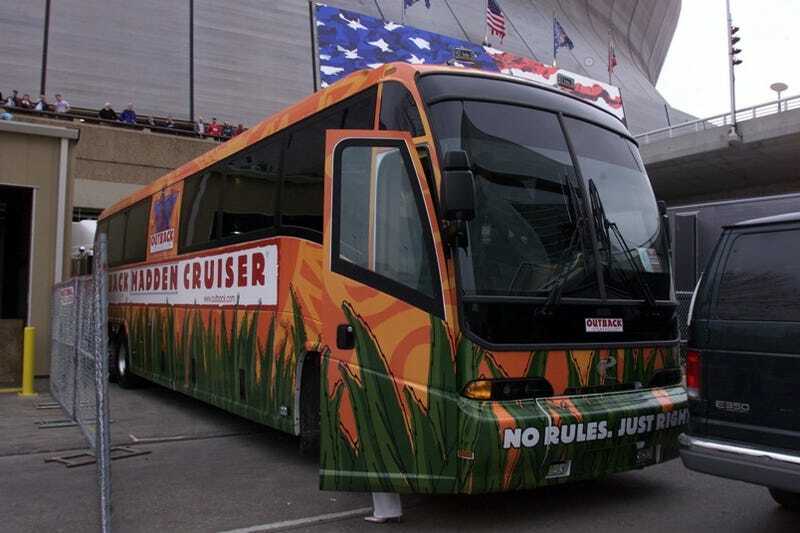 The current Cruiser is an $800,000 MCI E4500 45-foot custom shell converted to fit Madden's very specific needs. It's equipped with a mobile office fitted with a massive generator, high-speed satellite internet service, phones, fax service, and three plasma televisions. During the season a staffer is typically assigned to the vehicle in order to keep Madden prepped for the next game. From the bus he can review tape, send off email, or entertain guests. In addition to being an office, it's also a luxurious living space. In back is a private bathroom with real cherrywood paneling, granite floors, and a sauna/shower. Madden's bedroom has a queen-sized bed and a plasma television for watching whatever he pleases. Up front is a small kitchen (stocked with M&Ms), dining area, galley with another bathroom (for his drivers), and a comfortable couch and living space for the crew. Sponsored by various groups, the most recent iteration is courtesy of MCI Coach and Outback Steakhouse. As John Madden himself might say: "It's an apartment on wheels, which means you can live in it and drive it simultaneously."